For users of the Fatigue Module, COMSOL Multiphysics® version 5.3 brings vibration fatigue, a new way to evaluate fatigue damage that is used for simulating a structure subjected to a harmonic excitation. Read more about this Fatigue Module update here. 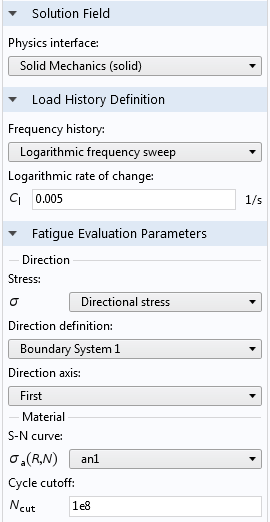 Settings window for a vibration fatigue evaluation where the vibrational fatigue is applied through a logarithmic increase of frequency in the Frequency history drop-down menu.